Mechanical Smile are an alternative rock band from Ayrshire, and one of the finest in the country at that. They’ve made festival appearances at Download, IROCK and Slam Dunk, featured in Rock Sound, FRONT and Kerrang! Magazine as well as headline tours, selling out King Tuts and touring Germany – Mechanical Smile are the real deal. We caught up with Dawn and Murray to find out more about the band, their sound and their own Rip It Up festival that they curate as a band. Firstly, can you introduce the band to us? Dawn (Lead Singer/Guitarist), Nic (Bassist), Callum (Guitar and Backing Vocals) and Murray (Drums and Backing Vocals). For those just discovering the band – how would you describe your sound? Dawn – We play alternative rock music which is very melodic, catchy and anthemic with hints of grunge, pop and rock! What’s the must-hear Mechanical Smile track? Murray – We are really excited bout our new track Say Goodbye which features on our album set for release on 17th Feb, but the song that is a must hear would be Take Me To The Otherside, it seems to be everyone’s favourite and we still love paying it. What are the band currently up to at the start of 2014? Dawn – We are releasing our album on 17th Feb and to celebrate we are going on our biggest tour to date. We are playing 19 shows across the UK and Germany between Jan 23rd and March 23rd. We will have a video out for the new track Say Goodbye come the end of January. We can’t wait to get on the road again! Dawn – We are hoping for some more summer festival appearances. In 2012 we played some big festivals like Download and Slam Dunk, and last year we played some amazing smaller festivals like Kilmarnock’s Dirty Weekender and WakeTheDeen. You played an impressive amount of festivals in 2013, do you have a stand-out favourite memory from those? Murray – I think IRock in Germany has to be one of the best memories from 2013. We played in front of 1200 just as the sun was going down in an open air festival. The atmosphere was electric and we put on one hell of a show! We closed our set with our acoustic track Wolf with just Dawn playing herself and the audience were in tears, the emotion and atmosphere was unreal, amazing experience! How does playing at festivals compare to playing at local venues? Do you have a preference? Dawn – There is something special about playing festivals and we are hoping to get some good slots this year, but at the same time it all depends on the show. Smaller venues you have that intimacy you don’t get playing festivals and you can really connect with your audience. Festivals are great as it’s a chance for people who have never heard you before to see something new but you can’t beat a packed out venue full of die-hard fans signing their hearts out to your songs. You’ve supported some great bands on your journey – what’s been your favourite slot? Murray – We have had a god few slots over the years but my favourite support slots, and one of my personal favourite gigs was when we supported Stiff Little Fingers at the Grand Hall in Kilmarnock our home town. We didn’t know what to expect as SLF have been around for years and have a big punk following all over the world. We went on stage and did our thing and the reception was amazing. The band themselves were watching from the side and said it was a breath of fresh air on their tour to have a young original band opening for them. Back to you as headliners, where is your favourite place to play and why? Dawn – My favourite venue has to be our local pub Fanny By Gaslight AKA “Fanny’s”. It’s a typical rock pub that loves live music and over the years we have had some amazing gigs in there. It’s a raw and in your face atmosphere and all the staff are so friendly and welcoming and their passion for live music is amazing! We finish off our tour with a headline show in Fanny’s on March 23rd. You toured Germany in 2012 – how was that? Murray – Germany is amazing. The people, the food and the passion over there is something special. We did a very small tour in October 2012 and loved every min of it. We have a five-day tour booked as part of our Say Goodbye album release tour and we seriously can’t wait to go back over there. The crowds are wild, it’s amazing! Dawn – I would love to play The Hydro in Glasgow. Some of us went to see Queens Of The Stone Age when it just opened and we were blown away! Such an amazing venue! In your time as a band do you have an all-time favourite gig that you’ve played? Murray – It has to be Download Festival 2012. We played early on the Sunday in the Red Bull Bedroom Jam Tent. It was our biggest ever gig, the tent was packed and the sound, atmosphere, and buzz playing such an amazing festival was just unreal! You also founded your own festival (Rip It Up) – How did that come about? Dawn – We created Rip It Up as there was nothing regular for under 18’s to go to and experience live audience. Loads of kids in our area knew about Mechanical Smile and were in bands but had no way of going to a gig. We created Rip It Up and it really just took off. 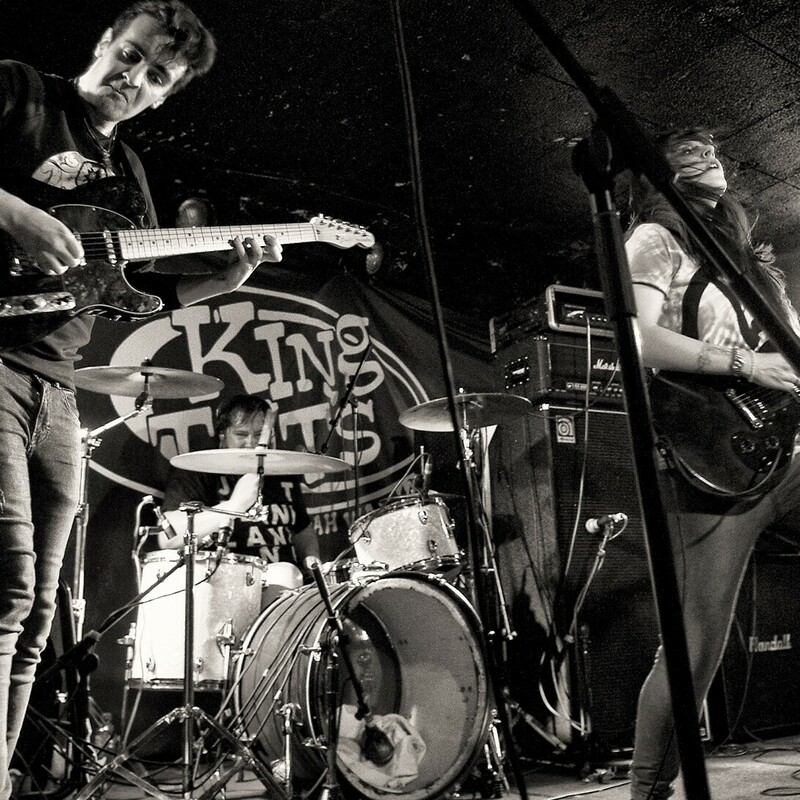 We organised three Rip It Up gigs and then took a Rip It Up stage over three days of Kilmarnock’s Dirty Weekender Festival in 2013 and every night was a huge success. We then went on in the summer to host our all day Rip It Up Fest and have since hosted another five shows where we have branched out with acoustic shows and over 18 shows. We are again involved in running a stage for KDW in 2014. We really feel we are bringing something to the community and the support with the local papers and the kids/adults who attend has been amazing! Back to making music – what is your process for writing? Murray – Dawn writes all our music at home on either her acoustic guitar or electric guitar through a tiny practice amp. She comes up with these amazing songs and lyrics and ideas and once she has something concrete and almost finished she brings it to the studio. We then all add our input and chop and change parts suggest other methods etc. We spend a lot of time polishing off our songs until we are all really happy with them. Dawn – We have recorded at different studios over the years but we seem to have found our home in Dundee. The last few times we have worked with producer Graeme Watt at Seagate Studio in Dundee. We were let down last min by a studio in Glasgow when we were recording Set The Spark and we were in a panic We phoned round some studios recommended to us from friends and Seagate was the only one available at short notice. We didn’t know what to expect, but Graeme is such a cool, relaxed guy and made us feel very comfortable and he is on the ball with everything too. We were really happy with the recordings and the studio is right in the City Centre so it’s handy for food and coffee too! For our musically minded readers, what is your gear set up in the studio and does this change live? Murray – When we record, we like to take advantage of some of the studios better gear, it’s quite a luxury ha ha. We use our own guitars etc but Callum and Dawn like experimenting with different amps until they find the right sound. Live we tend to use all our own gear especially when touring. Dawn plays a Gibson Les Paul junior through an orange micro terror and Marshall 4×12 Cab using Boss Chorus and Boss Distortion pedals. Nic plays a fender jazz bass through Hartke lh 500 bass head and Ashdown mag 410t Cab. Callum plays a Fender Jazz Master through a Randal matching Head and 4×12 Cab using a Boss multi effects pedal board. Murray has Premier Cabria Drum Shells, Zildjian A Custom Crash, Zildjian K Crash, Zildjian A Custom Hi Hats, Turkish Ride Cymbal, Mapex Black Panther Black Widow Snare Drum and a Tama Iron Cobra Single Kick Pedal. Finally, fast forward to 2017 – Where are the band now? Dawn – We will be living next door to Dave Grohl renting out our hot tub to Jack Black. Mike Tyson will be our security when we are headlining the Hydro and we will have been to an LA Lakers game wearing sun glasses indoors perving on the cheer leaders!